They evaded humans for millions of years and live very private lives. The hulking, fleshy-finned fish known as the coelacanth has beguiled scientists for generations. But the coelacanth mystique that enchants researchers also makes it difficult to study. Researchers recently revealed in Nature Communications one startling aspect of the coelacanth lifestyle: they might be monogamous. Presumed extinct for over 60 million years, the coelacanth (SEE-lah-kanth) was known only in fossil form until a fisherman caught a live one in 1938 near South Africa. Recently, scientists have found populations of dozens of coelacanths nestled in caves hundreds of meters deep in the Indian Ocean near Kenya, Tanzania and the Comoros Islands. Monogamy poses a risk to coelacanths in part because of the onerous three-year-long pregnancies in females. The babies are fully developed when they’re born, but the mother sacrifices a lot of energy and is more vulnerable to predators while she carries her young. If one male with a bad set of genes sires the brood, all the offspring can suffer—and those three years might be wasted. Group formation of coelacanths within a single cave off Grand Comore. Photo by Hans Fricke. The study’s authors expected coelacanth females to find multiple mates to ensure that at least some offspring get a good set of genes. They conducted genetic paternity tests on the 49 total offspring of two preserved pregnant coelacanths. 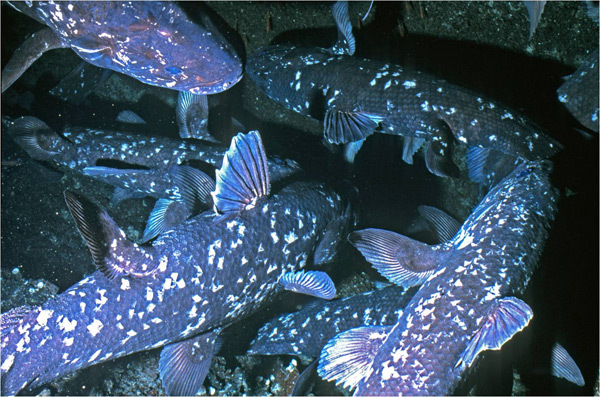 Analysis showed that each coelacanth chose only one male to sire her brood. “The females really put all their eggs into one basket,” said biochemist Manfred Schartl of the Theodor-Boveri-Institute for Biosciences in Würzburg, Germany, the study’s corresponding author, in an interview with mongabay.com. 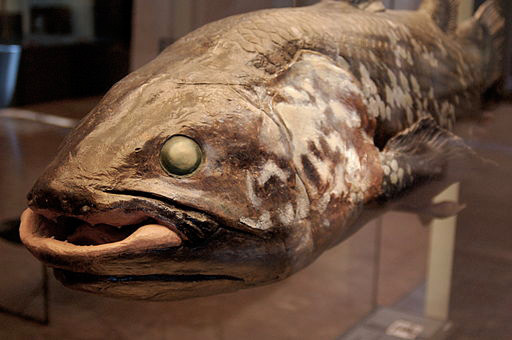 Because coelacanths are endangered, scientists can only examine dead specimens that fishermen accidentally catch in trawls. 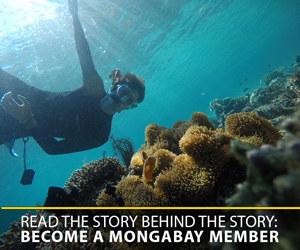 Pregnant females are especially rare: one fish was caught near Mozambique in 1991, and another near Zanzibar in 2009. “What they did is remarkable with the little information they have. It is extremely difficult to obtain samples of coelacanths, let alone gravid [pregnant] ones,” said marine biologist Giacomo Bernardi of the University of California, Santa Cruz, in an email interview with mongabay.com. But Bernardi isn’t yet convinced that all coelacanths are monogamous. Although the sample size of two is small, the coelacanth’s low genetic diversity gives him more pause. Stuffed coelacanth at ETH University, Zurich. Genetic diversity depends on the number of variations, or alleles, in genes within a group of animals. All animals have two alleles of any given gene, one from mom and one from dad. If all the male coelacanths have the same allele for a particular gene, then a genetic paternity test based on that one gene would make two males look like the same individual. Schartl said that his colleagues accounted for this by surveying a wide array of genes to make sure the paternity test would show any variation in the alleles between siblings. However, it’s unclear why a coelacanth would only mate with one male at a time. “It’s not that these fish are swimming lonely through the ocean for years and years just trying to find a partner,” Schartl said. Indeed, his colleagues in Germany have used a submersible explorer to find stable groups of 20 or more coelacanths. Schartl suggests monogamy in coelacanths could arise because females cannot physically store sperm from multiple males. However, monogamy is rare in the animal kingdom. Both Schartl and Bernardi caution that more studies are needed before making definitive claims about the coelacanth lifestyle. Cynthia McKelvey is a graduate student in the Science Communication Program at the University of California, Santa Cruz.